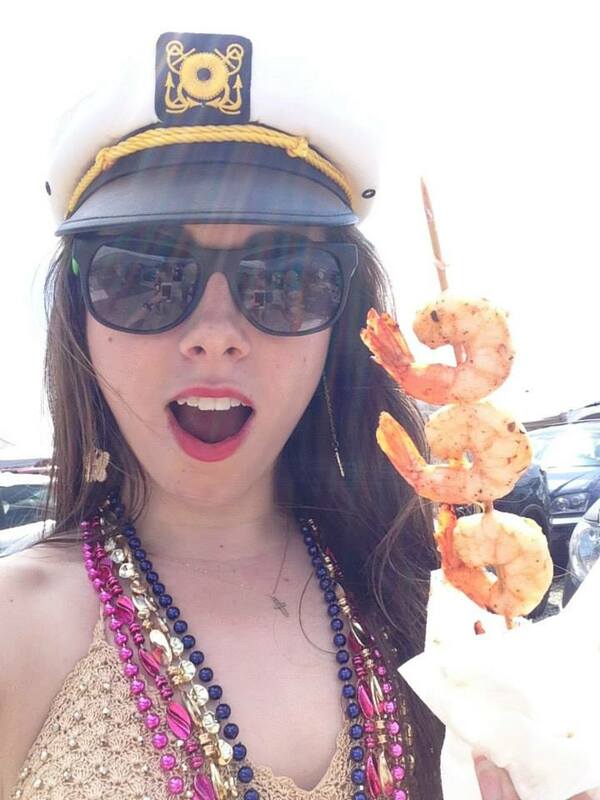 ‘Selfie’ taken at a recent Jimmy Buffett concert, featuring this post’s author and a free (delicious) shrimp kebab. Never in my life have I turned down more drinks than the weekend I went tailgating at a Jimmy Buffett show this summer (and yes, with parents who have been Parrotheads for the last 17 or so years, I fully saw it coming). Buffett is like a religious experience—they have it down to a science. The tailgating, the celebrating, the party in the lawn, it’s all rather ceremonial. The Parrotheads—the official name of those who frequent Jimmy Buffett’s concerts—come in droves, hauling portable grills, cases of beer and pirate flags; dressed in Hawaiian print button-downs, coconut bras, leis, beads and bandanas; many arrive already highly intoxicated, and the rest will soon throw back copious amounts of colorful shots and moonshine-soaked fruit, the effects tempered only slightly by their fresh-off-the-fire burgers. For my own Buffett attire, I selected a captain hat, and thus earned myself a new nickname. Strangers shouted “Captain” at me approximately every five minutes (I assure you this estimation is not an exaggeration). But the most interesting part of the entire experience was not my new nickname; it was the unusual encounter with seemingly endless offers of free alcohol. I regularly field a lot of questions following my (mostly) polite refusals to drink offers. While I’ve been frustrated at times, being around people who are drinking does not usually bother me. Buffett was no exception. It was a tremendously enjoyable experience, even sober. In addition to drink offers, I was handed a free shrimp kebab—which was so delicious I almost went back to search for the guy and ask for his shrimp sauce recipe. Everyone I met was insanely friendly and welcoming, and they didn’t pressure me to accept their drinks after their initial offers were declined. To be clear: I am 21. For me, not drinking alcohol is a choice unrelated to the law, religion or health, though I do appreciate the health benefits of not consuming alcohol. I have watched people close to me, including multiple family members, abuse alcohol, but their issues don’t serve as my primary motivation, either. But that explanation—that my choice to abstain from alcohol is not primarily motivated by legality, family, health or religion—is usually where the confusion starts. It is also where a recent Cosmopolitan (yes, Cosmo, please calm down and give it a chance first) article becomes highly relevant. The piece is called “22 Things You Should Never Say to Someone Who Doesn’t Drink” and was sent to me by a friend who does drink, but respects my choice not to. Needless to say, as a college student who doesn’t (always) live under a rock, this article hit home. This is the original number that most resonated with me. My personal reaction truly was the response that I’ll borrow from the article: “Alcohol’s a beverage, not a measure of moral superiority (or inferiority). So no, I just don’t want a drink.” Trust me, it really is that simple. If you think I don’t want to be around you or you don’t want me to be around when alcohol is involved, maybe we should have a conversation about that. As Buffett proved to me, I can enjoy being around people who are drinking. If you don’t enjoy my company because I don’t drink, I’m cool with ending things. Really. Bye. Same goes for #17. To everyone who pressures others to drink alcohol: Stop. To everyone who has been or continues to be pressured: Stay strong and own your decisions, because they’re your choices to make. To all the people who respect others’ choices—whatever they may be—regarding safe and legal alcohol consumption: Thank you. The world needs more people like you. And finally, thank you Cosmo, for publishing a listicle that so perfectly captures so much of my college experience. My conclusions: Parrotheads are the best—really, they’re great. Alcohol is good, just not something I’m interested in putting in my body. I appreciate friendly people who respect that. (And let me be clear, for the fifty-millionth time… People of the world who do consume alcohol: I am not judging you. Let’s all have a good time together. I won’t be drinking. I won’t be upset if you are. I will be upset if you endanger anyone, including yourself, but that goes for pretty much all situations in life. None of these conclusions are new to me, but they were greatly reaffirmed by this one-of-a-kind experience with excessive alcohol consumption and the masses. I slapped on a smile—which was both genuine and constant—and just rolled with it, and that is how I soberly survived Buffett. The show and the party were one hell of a good time.